List of Stephen F. Austin's Old Three Hundred. Courtesy of the Texas State Historical Association. Image available on the Internet and included in accordance with Title 17 U.S.C. Section 107. 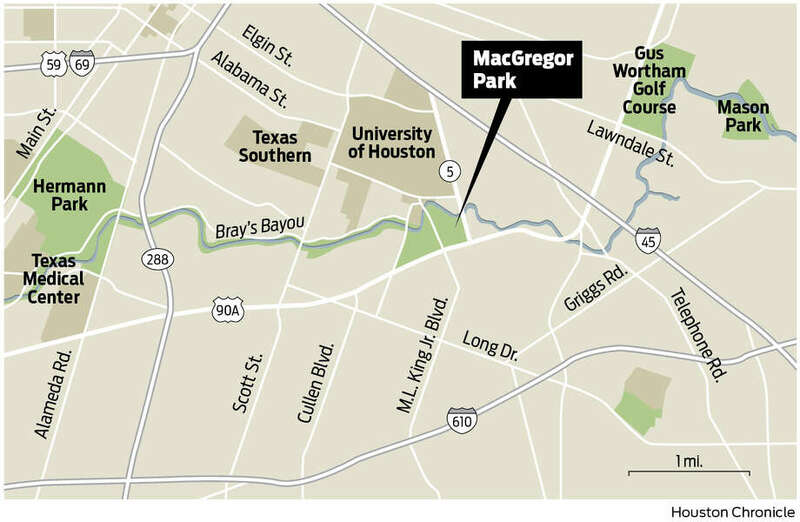 Map of MacGregor Park, which occupies some of the land that belonged to Luke Moore in the 1800s. Courtesy of the Houston Chronicle. Image available on the Internet and included in accordance with Title 17 U.S.C. Section 107. MOORE, LUKE (?–ca. 1837). Luke Moore, soldier and member of the Old Three Hundred, received title to a league of land in what is now Harris County on August 3, 1824, and located his claim on Bray's Bayou. William B. Travis was retained as attorney in a title suit against Moore in October 1833. Moore died before December 1837, when Thomas Earle, administrator, was offering land in the Moore estate for sale. In 1838 Moore was issued a headright certificate for a labor of land in Harrisburg County, after his death; he received 640 acres for his service from July 15 to December 15, 1836, and a bounty warrant for 320 acres on February 2, 1838, for his service, including his presence at the siege of Bexar, from September 27 to December 18, 1835; patents of 320 and 640 acres in Limestone County were issued to a Luke Moore on February 9 and May 20, 1846, respectively. Lester G. Bugbee, "The Old Three Hundred: A List of Settlers in Austin's First Colony," Quarterly of the Texas State Historical Association 1 (October 1897). Louis Wiltz Kemp Papers, Dolph Briscoe Center for American History, University of Texas at Austin. Thomas L. Miller, Bounty and Donation Land Grants of Texas, 1835–1888 (Austin: University of Texas Press, 1967). Telegraph and Texas Register, December 30, 1837. William Barret Travis, Diary, ed. Robert E. Davis (Waco: Texian, 1966). Handbook of Texas Online, Diana J. Kleiner, "MOORE, LUKE," accessed April 25, 2019, http://www.tshaonline.org/handbook/online/articles/fmo34.